We've already taken a look at Sapphire's first Intel-based motherboard: the Pure Black X58, which together with the AMD based White Fusion announced Sapphire's re-emergence into the motherboard market. Hot on its heels comes the second high-end Intel based board, the Pure Black P67 Hydra, which, as you might gather from the name, not only uses Intel's current flagship chipset for the Sandy Bridge CPU's, the P67 Express, but also makes use of Lucid's HydraLogic graphics technology. Using Lucid's mix and match technology is a neat sidestep around the problems of multi-GPU licensing for a company like Sapphire, well known as one of AMD biggest AIB partners. Trying to go cap in hand to prise an SLI licence out of Nvidia would have been an interesting, if brief conversation, if nothing else. The first thing that catches the eye are the four PCI-e graphics slots, only the top one of which runs at full x16 speed. The two following slots run at x8 speed while the fourth grey coloured slot runs at just x4 speed. The extra PCI-e lanes over and above that offered by the P67 chipset itself is another bonus of the Lucid Hydra silicon Sapphire has included. As this is a board aimed at the higher-end of the market if comes as no surprise to see Japanese solid capacitors and high performance chokes in the 6+2+3 phase power design. Sapphire has also added in the usual extras to keep overclockers happy, such as reset and clear CMOS buttons, dual switchable BIOS chips and voltage measuring points. 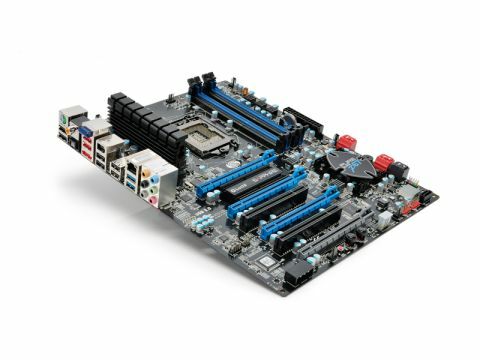 The standard specs for the P67 chipset provides six SATA ports usually split between two SATA 6Gbps and four SATA 3Gbps ports. Sapphire has fitted a Marvell 88SE9128 controller to provide third-party support for another two high-speed ports. The four SATA 3Gbps ports are split between two in a stack next to the SATA 6Gbps ones, one vertically mounted further in on the board and the fourth which is used to run the eSATA port on the rear panel. All the usual ports on the back panel are there: eight USB 2.0 and two USB 3.0 ports, FireWire, six audio ports plus separate digital coax and S/PDIF ports, LAN and eSATA with the surprise being the antenna for the integrated Bluetooth. Unfortunately though, like the Pure Black X58 before it, the overclocking performance of the board is limited by the power design. It has included options and little details, such as the voltage read points, designed specifically for the overclocker, and yet hasn't beefed up the phase count. Though thanks to the limited overclocking performance of most of the P67 boards we've seen that doesn't effect it's position in the mid-range.